Despite being the true home of Pocket Monsters, until today, Japanese fans weren’t able to download the smartphone phenomenon that is Pokemon Go. As rumored, Niantic Labs’ game launches in Pikachu’s homeland with a promotional tie-in with McDonald’s (it’s already offering Pokemon toys with its kids’ meals in anticipation) and the app maker says more sponsored locales and events are on their way. Ingress, the location-based game that preceded Pokemon Go, ran multiple promotions with companies including McDonald’s and SoftBank in Japan — as well as Jamba Juice in the US. Expect see plenty more sponsored locations in Pokemon Go (well, gotta make some money when the app is free to download), but what exactly do the sponsored locations entail? The good news is that the tie-in doesn’t seem to change much at all — and could even be good news for some players. It is, however, a substantial sponsorship. Typically, Pokestops (where you pick up items) and Gyms (where you battle other trainers) are centered around cultural points of interest — or just interesting things. The deal struck with McDonalds adds stops and gyms to the locations of almost all of its 3,600 restaurants. My local burger hole is a mere Pokestop, although according to Twitter, there are plenty of gyms to be found in the chain, too. In a leaked email which resulted in a further delayed launch almost a month after Europe and the US, the company pointed out concerns over poor connectivity in McDonald’s restaurants, as well as people lingering without making any purchases. However, the ubiquitous chain claims that there will be places for users to develop and catch more Pokemon. Not everyone lives in a major city filled with landmarks and cultural curiosities, but there’s pretty much a McDonalds in every town in Japan. 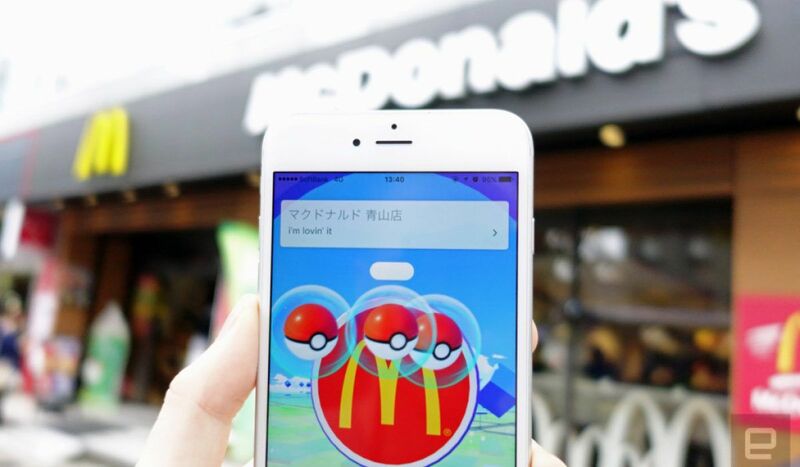 Like Nintendo, McDonald’s has already seen its stock price buoyed following rumors of the collaboration, but whether people will actually choose to enter, pay for something, then capture or battle Pokemon remains to be seen. I stood outside to grab my Pokemon items — after all, there’s no faster way to undo all those calories burnt walking around on the hunt for a Psyduck than paying a visit to a fast-food establishment.